We love dark chocolate, and there are some weeks that we’ll eat it every day. Just a half serving with some raisins, nuts, or peanut butter. Dark chocolate is really healthy for you too, the darker the better. I occasionally purchase Chocolove brand 77% and 70% Belgium dark chocolate bars. It offers a very rich, decedent chocolate flavor. Really delicious. A half serving is very filling! Even though it does taste wonderful, it’s not something I purchase regularly. It’s not organic or fair trade, and it does contain soy lecithin, which I am not thrilled with, but it’s a good choice to purchase once in awhile. http://www.foodispower.org/chocolatelist.htm – Chocolove is on the “Cannot recommend but are working on the issues in various ways” list, so hopefully one day, they will be recommended fully! Updated: For a list of recommended chocolate brands, check http://www.foodispower.org/chocolatelist.htm. I like taking a bite of plain dark chocolate with a one or two nuts (cashews, pecans, almonds, pistachios), that way I made my own nutty chocolate bar in my mouth. Same with peanut butter. Spread a bit on top of a few dark chocolate squares, and you’ve got a healthy version of Reese’s Peanut Butter Cups! What does Chocolate Percentage % Mean? 100% chocolate is 100% unsweetened pure chocolate, either in the form of cocoa, chocolate liquor, and/or cocoa butter. The higher the percentage, the higher the actual chocolate content. The lower the chocolate, the higher the sugar. I usually eat a 1/2 serving of dark chocolate almost every day. It is so healthy, and the darker the better. Start off with 60% and work your way up to 70%, then 85%. Once you get to 85%, the added sugar immensely decreases, and the fiber increases! Keep in mind the calories and fat (sat fat) increase, but if you keep it to a half serving every day, it can be a good snack choice. Plus, it’s been said that the saturated fat from chocolate is composed much differently than beef saturated fat. Please make sure you read the labels on different brands, as the nutritional data can differ. A lot of manufacturers are using partially hydrogenated oil instead of cocoa butter. Ingredients: Organic Raw Cane Sugar, Organic Whole Milk Powder, Organic Chocolate Liquor, Organic Cocoa Butter, Soy Lecithin (Emulsifier), Organic Vanilla Extract. Notice how the FIRST ingredient is sugar, then milk! Sugar is second, while milk is last. Unfortunately, I love Green & Black’s Organic chocolate, but it’s actually a UK company now owned by Kraft Foods. sigh. So many big food companies are scooping up smaller food companies, and it’s getting hard to find a decent chocolate. So, READ LABELS! Check the ingredients! I keep telling myself to find another chocolate brand, but it’s hard because the Green & Black can be purchased for a good price. We eat so much chocolate between the two of us, it’s a difficult decision. UPDATED 2012-01-6: I’ve since realized that saving money when buying chocolate isn’t worth it. Just as buying meat from a local, ethical farm is important, supporting chocolate manufacturers that are truly fair-trade is also important. For a list of recommended chocolate brands, check http://www.foodispower.org/chocolatelist.htm. I got two larger zucchini squash this week in my CSA share and I decided to try baking a zucchini bread. 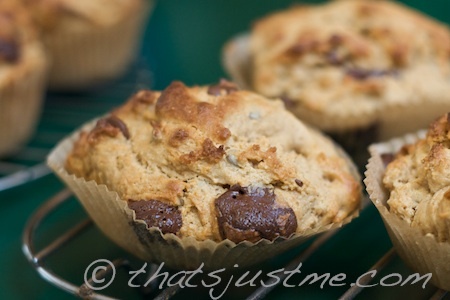 To add a little extra flavor & nutrition, I tossed in wheat germ, dark chocolate, walnuts and sunflower seeds too. Yum! 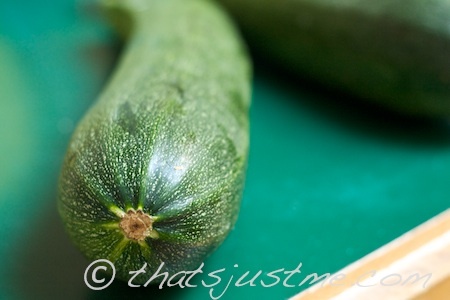 DH is not a fan of zucchini, and he even thought it tasted good. 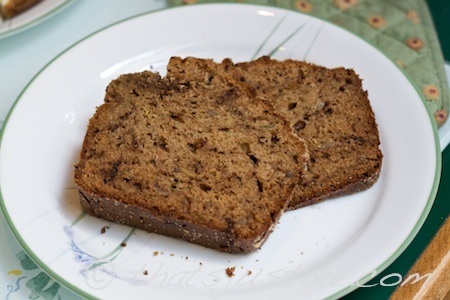 I found inspiration from the Zucchini Bread recipe on All Recipes, but similar to my banana bread, I wanted to reduce the sugar. I think I’ve done that for this particular recipe. Eating clean doesn’t mean giving up rich foods like chocolate! There are some days that I just feel like I NEED chocolate, and as long as I consume in moderation, it’s all good! And I don’t mean Snickers or Reese’s Peanut Butter Cups. Have you read the ingredients!? Yuck! I’m talking about REAL chocolate….the “dark” variety if possible 65% or higher, although partaking in rich yummy milk chocolate every once in awhile is okay too. I have tried several brands, and one of my favorite is Divine Mint Dark Chocolate. It’s different than some of the other mint flavors/brands because when you take a bite, you’re tasting crushed chunks of peppermint stick candy! I love that! It’s 70% dark chocolate, which is a good amount to look for and it’s made with “fair trade” ingredients, which is very important. Now, keep in mind, you can’t eat the whole bar in one sitting! Remember, it’s all about moderation! Break off four squares for under 100 calories. Yum! It’s a healthy afternoon snack! Anyone out there try Chocolate Cheerios? Whatd’ya think of ’em? No surprise, of course, her loyal followers were gushing all over them! One naive woman even compared them to cocoa puffs, thinking they were healthier. Are people really that stupid, or is it just laziness? Do people even bother to read labels anymore? What, so it carries the Cheerios name, and it automatically HAS to be healthy right? WRONG! 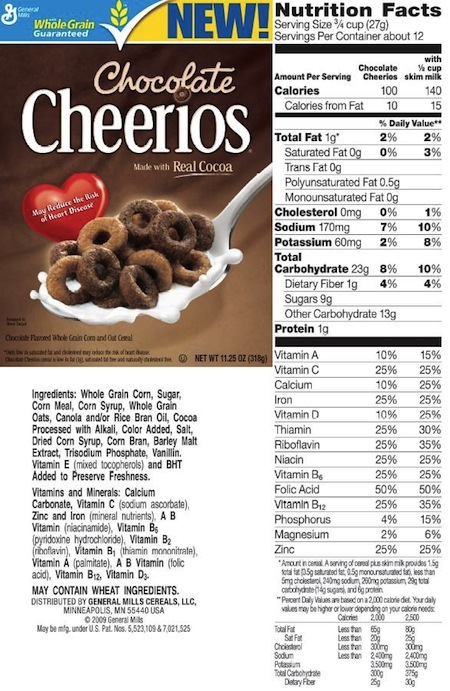 Take a look at the ingredients for both Cocoa Puffs and Chocolate Cheerios, and try to figure out which is healthier. Same calories and portion size. The Chocolate Cheerios have a little less sugar and fat. 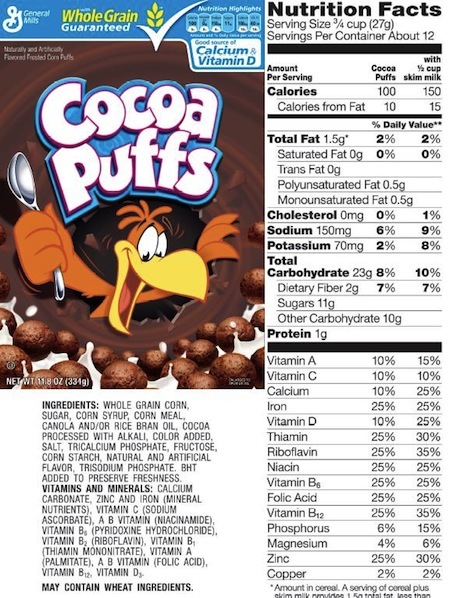 The Cocoa Puffs have more fiber along with more fat, but it’s mono-saturated fat. The ingredients list on both products is almost identical. But because one is named “Cheerios” people automatically assume it’s healthy. My big problem with Hungry Girl and sites like hers, is that her followers are substituting so-called bad foods with what they think are better alternatives, instead of figuring out how to reduce the bad foods, and only eat them occasionally as a treat. Why not just reward yourself with real chocolate once or twice a week, but just in a smaller portion? For about 100 calories I can eat 6 squares of Green & Black Milk Chocolate and it satisfies my sweet craving and I am not putting dangerous chemicals like BHT into my body. I just don’t eat chocolate every day! But these people are eating Chocolate Cheerios every day for breakfast and/or snacks. And then everyone wonders why the US is so overweight and obese. Hmm, and kids are eating this crap too! Not good.